Back in 1948, Westport muralist Robert Lambdin (1886-1981) was commissioned by the Black Rock Bank & Trust Co. to paint a mural for the community to enjoy. He spent two months researching Black Rock’s history at the Fairfield Historical Society (now the Fairfield Museum & History Center) and then three months working on the piece. He created a 20-foot long mural entitled “Old Black Rock Harbor, c. 1810” which depicts the harbor as he envisioned it in the 1800s. It features a ship unloading its cargo onto the docks and shows the Black Rock lighthouse in the background. The eight-foot tall mural hung in the bank building at the corner of Fairfield Avenue and Brewster Street for nearly 70 years. When the building underwent a complete renovation last year, the heavily damaged mural was rescued from destruction. The Fairfield Museum is now in the midst of restoring this Black Rock landmark. During the 1930s and 40s, Lambdin was one of Connecticut’s most sought-after muralists, winning several commissions through the Works Progress Administration to depict American life in public buildings such as libraries, schools and post offices. A few remaining examples of Lambdin’s art have been preserved in Westport and are highly valued today. Thanks to a generous grant from Bank of America, as well as donations from private individuals, the mural’s restoration is already underway. 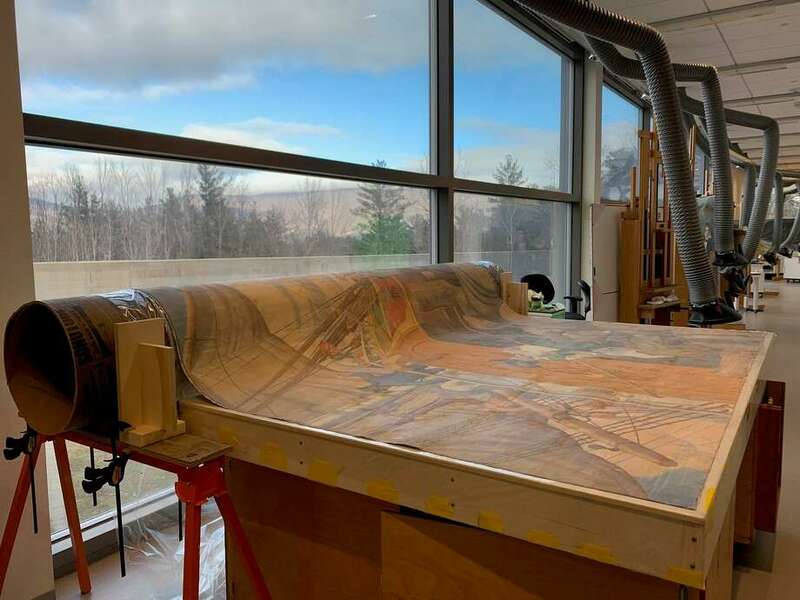 It is being cared for and restored at the Williamstown Art Conservation Center in Massachusetts, one of the top art conservation labs in the country. The Fairfield Museum is now seeking the community’s help through a “Go Fund Me” campaign to raise the final dollars to finish the project. The restored mural will be put on public view in the Museum’s “Creating Community” exhibition later this spring, and all donors to the restoration will be prominently recognized on a plaque that will be hung next to the mural. The Museum is grateful for the support of Bank of America, the Black Rock Community Council, Bruce and Michele Hubler, and Jack and Kay Collins for their generous contributions.